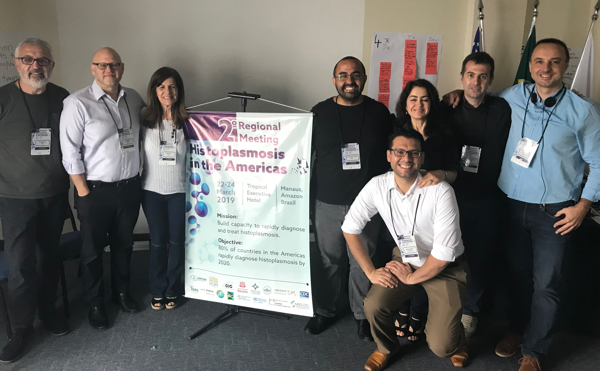 At the 2nd meeting on Histoplasmosis in the Americas and Caribbean in Manaus, Brazil, March 22-25th 2019, the 80 by 2020 target has been superceded by 100 by 2025 target. By 2025, every country should have access to rapid testing for histoplasmosis (antigen or PCR/molecular) and availability of itraconazole and both standard and lipid formulation of amphotericin B in the public sector. Representatives (doctors, scientists and public health specialists) from all Latin American countries except Bolivia, Paraguay and Uruguay, as well as Jamaica, Cuba, Dominican Republic and Trinidad and Tobago, spent 3 days discussing how best to utilize the new knowledge about the value of new rapid testing for histoplasmosis. Histoplasmosis in AIDS is at least as common as tuberculosis in many locations in Latin America and probably the Caribbean, but causes more deaths because of a lack of rapid testing and both access to and problems with current therapy. GAFFI’s Guatemala program providing rapid testing for opportunistic infections in AIDS was described in detail and showed the value in screening for histoplasmosis, tuberculosis and cryptococcal meningitis. 85% of the AIDS clinics are covered by the program and in 2018 2,563 ill HIV patients were tested with 17% having a life-threatening infection of which 62% were fungal, mostly histoplasmosis. In 2019, lateral flow assays for Histoplasma antigen will be launched by at least 2 companies. These promise to be highly sensitive for disseminated histoplasmosis in AIDS (80-95% in urine) and specific. PCR on blood is also very sensitive (>95%) and also highly specific. The Manaus Declaration seeks to ensure that all advanced HIV patients in the Americas and Caribbean have timely access to one of these tests (ie with 48 hours in a working week). Optimal therapy for histoplasmosis requires itraconazole (which is probably available in all countries (uncertainty about Bolivia and Haiti) or amphotericin B. Conventional amphotericin B is not available in Guyana (and there is uncertainty about Haiti, Bolivia and Trinidad and Tobago). Lipid amphotericin in not available in Honduras, Nicaragua, Costa Rica, Guatemala, Panama, Ecuador, Guyana, Surinam. The Manaus Declaration seeks to ensure that all advanced HIV patients in the Americas and Caribbean have access to all 3 antifungal agents in the public sector by 2025. The meeting was supported by many partners, especially the US Centres for Disease Control and PAHO.